This is a collection of papers presented during the Summer of 1992 in Colorado Springs. The speakers included James and Kenneth Corum, James Hardesty, John Sutton, Gary Johnson, J.F.X. Daum, Sid Romero and George Wiseman. The topics were the History of Wireless & Vacuum Tubes; Tesla Coils & the Magnifying Transmitter; Alternate Energy Research; and, Advancing the Physics Paradigm. 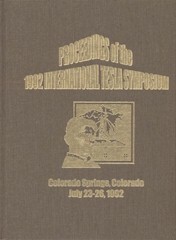 Click here for a list of published papers from the 1992 Colorado Springs Tesla Symposium.